It’s my job. i smoke the turkey (the tongue-in-cheek recipe was in an earlier post this week). You have to get up early to smoke a turkey for a 3:00 p.m. dinner. To smoke it right, that is. It was a bit tougher this year. It started raining last night. It’s on and off today. That increases the work involved with smoking a turkey, especially if you are not used to it, and i certainly am not used to it. i don’t think i’ve ever experienced a Thanksgiving in the Southwest corner when it was rainy. It’s usually dry, and for some reason, there have been a lot of Santa Ana’s on Thanksgiving: wind flow from the desert making the day even warmer for the season. Not this year. i donned my rain gear, struggled with getting the coals started, made sure stuff i used was protected from rainfall, and will be monitoring more frequently than normal from now until closing in on mid-afternoon. i love Thanksgiving. It’s about giving thanks, not about getting stuff, not about praising others, not about going out and having fun. It’s not using it as a political platform. It’s about home, family, and, of course, giving thanks. It is also about what things should be, should have been. People sharing with people. So it’s not too hard to get up when i can see the stars. But there were no stars today, not just overcast but drizzles. First light was muted with the cloud cover, but still stirs me as it has for years especially on the morning bridge watches. There will be moments of sadness for me. i will regret my grandson Sam, Blythe, and Jason aren’t with us. But i will be comforted knowing they will be having a lovely thanksgiving with a delicious turkey and trimmings from Sam’s grandmother. i will feel an empty spot for Joe and Martha but again be okay because i know they will have their families around them. There will be no sadness when i remember all of those Tennessee Thanksgivings: Castle Heights Avenue, Wildwood Avenue, Waggoner (yes, i still spell it that way as the west end street sign was spelled “Waggoner,” and the east end was spelled “Wagoner” now adopted for the whole street; but i still prefer what was apparently a misspelling) Street, Lebanon; White Oak and Greenwich Avenue, Red Bank (Chattanooga), and (was it Kingston Avenue, Nancy Schwarze? ), Rockwood. Family, big classic dinners, children running everywhere, the kindest adults anywhere in the world who loved to laugh, autumn leaves covering the ground, and after dinners belly-full naps, fires in the fireplace (Chattanooga only). Good times for which to be thankful. And today, thanks for sister-in-law, at least one daughter here with us. Smoked turkey. And thankful for all of those folks who have suffered injury and disease but survived. And thankful for all of those who loved and lived and shared their living with me but are now gone on to another thanksgiving. And thankful for the Pilgrims and the Wampanoag tribe in Plymouth who showed us how to live peacefully together and helping each other. 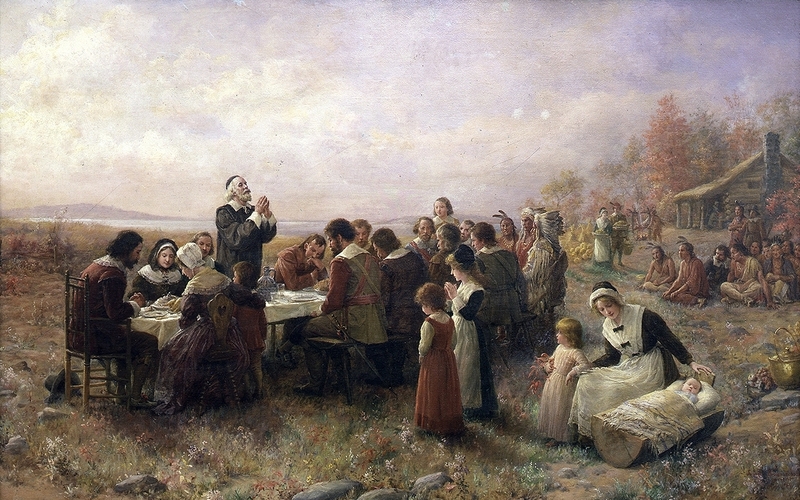 According to Wikipedia, ninety Wampanoag’s and fifty-three Pilgrims, the remaining folks who came over on the Mayflower celebrated the harvest for three days. With the lead of Squanto, a member of the Patuxet tribe and former English slave who lived with the Wampanoag’s and served as the interpreter; Wampanoag Chief Massasoit, and Plymouth Governor William Bradford for making it happen and providing the fowl and deer for the feast. And let’s not forget Eleanor Billington, Elizabeth Hopkins, Mary Brewster, and Susanna White who cooked the feasts, not a small feat by any measure. They showed us how to co-exist, which most of us have ignored since then. Joe is living it for me. And then from that Wikipedia item, there was the painting of Jennie Augusta Brownscombe. It took my breath away while i was waiting for the coals to get hot. Wow! i have a tradition. Actually, i have a bunch of traditions, some of them are closer to superstition, some are just to keep some folks happy, and a few, like this one, are mine, all mine. The more i think about it, the more i like this tradition. It’s sort of in line with JB Leftwich, the Coach’s tradition. Every year about this time but just a tad later, Coach would write one of his weekly columns for The Lebanon Democrat about a fruit cake recipe. i think it was a fruit cake, and i’m pretty sure it was his mother’s, but i am too lazy to look it up this morning. But i like the idea of following in Coach’s footsteps. It’s hard to go wrong that way. The below is from last year’s post. i should add i still cling to Mr. Dickel’s version of sour mash even though the Prichard brand with a distillery up in Kelso, Tennessee, must have some family connection. Both Jo Doris and Estelle carried the maiden name of Prichard, and it’s without the “t,” which makes them fairly unique. Someday, someday, i will find the Prichard family connection among the Leftwich’s, the Jewell’s, and the distillery. This, i think, is my new tradition. i wrote this recipe (sic) in 1990. i now am the Turkey Smoking Go-To at the Jewell household whenever we have Thanksgiving here with more than two people (If it’s just Maureen and i we find a very nice restaurant usually without a turkey dinner). i have published this a couple of times in The Democrat and posted it here several times. There is a more serious version with more exact directions, but i forget where it is every year and wing it. i was going to blow off putting it out in the newspaper or on the web this year, when Bill Goodner described how he smoked his turkey, i remembered turkey smoking being a JB Leftwich family Thanksgiving or Christmas tradition for Jim and Jack to smoke a turkey while tending to it with a Prichard whiskey in hand (it used to be George Dickel, and i still stick to the Tullahoma brand). My brother-in-law Daniel Boggs and my nephew Bill Boase, pride themselves on technically correct smoking. Well, i ain’t technical. i use an old Weber smoker, not as good as my smaller original like Jimmy Lynch used back when, but my smaller one rusted out about twenty years ago and you just can’t find them anymore. So now i add charcoal and chips throughout the process. A couple of months ago, we got a new Komodo dragon grill…just kidding: it’s a knock off of a “Big Green Egg” smoker Char-Griller dubbed the “King Griller Akorn Kamado Kooker” (“kamado” is the term used for a Japanese smoker, which looks like an egg). Therefore, i could become more technical. But i am a sentimentalist, and getting up in the wee hours of the morning to start the coals, top them with the soaked hickory chips (i tried mesquite chips once, but i’m from Tennessee: hickory chips are the only chips), put the turkey on the grill, pour the marinade from the bucket over the turkey and into the drip/water pan, and then tending to the fire and chips randomly and very carefully throughout the day gives me a sense of fulfillment. i am learning the awesome powers of my Komodo dragon grill and have found grilling steaks, pork chops, etc. is great, and i plan to to expand to seafood, fish, and Cornish game hens in the near future, but i think i’ll stick to my old smoker for the turkey. So Bill, i don’t think i can be of much help on electric smokers, but it i thought you might like this recipe. This year, there is no dog. When i put Lena, my last one down, i vowed not to have another dog until i was sure it would outlive me and put me down rather than vice versa. i still want to have a dog again, but not for helping me smoke a turkey. SAN DIEGO—Holidays, except for the weather, are pretty much the same for me out here in the southwest corner or back in Tennessee. To start, no one will let me smoke the turkey. When I was growing up in Lebanon, and every time I return there for a holiday, my mother cooks the turkey. When there are only a few of us there, she makes a chicken taste like a turkey. She roasts the turkey, or the chicken, in the oven, and it comes complete with dressing and gravy. When we have a holiday out here, my wife cooks the turkey the same way my mother cooks the turkey. Every Thanksgiving and Christmas, I volunteer to cook the turkey. Every year, whether in Tennessee or out here in the Southwest corner, whoever is in charge of turkeys says no. They profess to love the turkey the way I fix it, but they say another time would be better. They say they want a traditional turkey. I picked up turkey cooking while I was spending some considerable time about two-thirds of the way between here in the southwest corner and Tennessee. The Colonel, grandfather of my oldest daughter, lived up in Paris, Texas, and he fed me my first smoked turkey. I loved it. Since then, I have modified his recipe somewhat and do cook one fine smoked turkey. Since I can’t have it out here or in Tennessee, I thought someone with fewer traditionalists in their immediate family might like to have the recipe to try for the holidays. 1 container large enough to hold the turkey and cover it with the magic elixir. I’ve been known to use a plastic bucket, but sometimes the dog gets upset as we normally use it for his water dish. This is okay as long as we stay out of biting reach of the dog for two or three days. 1 smoker, probably any kind that claims to be a smoker and any number of possible jury rigs would work; however, if I were using a “Weber” or like vessel, I would make sure that there was extra water in the smoker). 1 bottle of beer. Beer in longnecks is preferable but one should not become too concerned about the type of beer as “Lone Star” is a bit too elegant for this type of cooking. Besides, we wouldn’t want to waste a beer worth drinking on some dumb turkey. If one is desperate and doesn’t mind subjecting oneself to abject humiliation, it is permissible to stoop to using a can of beer. 1\2 cup of Madeira. Again, I wouldn’t be overly concerned about the quality of the wine, and in truth, any red wine is probably okay. However, I would stay away from “Night Train” wine as it has been known to eat through barbecue grills, smokers, and anything made of material weaker than that used in hulls of nuclear submarines. Undoubtedly, there are numerous items that I have forgotten to list here, but that’s okay as it really depends on what your individual taste is — I don’t suggest substituting low fat milk for the beer, but most everything else is probably okay — and if it’s really important, I’ll realize I left it out when I get to the narrative of how to use all this stuff and include the forgotten ingredient there. Thaw the turkey. Take all those weird things that they put in those plastic packages inside the turkey and cook them in a skillet without the plastic packages, turning them frequently. Then feed what you just cooked to the dog. It might placate him enough to keep him from biting you for taking away his water bucket. If there are traditionalists in the bunch, give the stuff to them rather than the dog and let them make gravy. Put the turkey in large container. Pour beer and Madeira over turkey. If you have not allowed about 24 hours for the turkey to thaw or about 8-12 hours for marinating the turkey, call your invited guests and advise them that the celebration will be about two days later than indicated on the original invitation. Sprinkle other ingredients over the turkey. Be plentiful. It’s almost impossible to get too much. Crunch the garlic cloves I didn’t mention in the ingredients and add to the container. I normally use about four normal sized cloves for a normal sized turkey. Also add the previously omitted bay leaves, about 6-8 for that same normal sized bird. Add enough water to cover the turkey although it probably wouldn’t be a disaster if a leg partially stuck out. Then put the container in a safe place, unless of course, you want the dog to be rapturously happy and not bite you until long after his teeth have fallen out. Allow to sit undisturbed for 6-10 hours (longer is better and ten hours is not necessarily the upper limit but exceeding ten hours may have some impact on when you either eat or get tired of the turkey taking up all that safe space). Put the turkey on smoker grill above water pan after lighting the charcoal (one or two coals burning well is the best condition for the charcoal) and placing soaked hickory chips, which I also forgot to mention, earlier on the charcoal — again, be plentiful — after soaking the chips for at least 30 minutes. Pour remaining magic elixir over the turkey into the water pan. Add as much water to the water pan as possible without overflowing and putting out the fire below. Cover. Do not touch. Do not look. Do not peek…unless it doesn’t start to smoke in about thirty minutes. Then peek. If it’s smoking, leave alone for at least six hours for a large normal sized turkey. It is almost impossible to overcook if you have added enough water at the outset. You should check and add water or charcoal throughout the process. I have found that mesquite charcoal is the best, as it burns hotter. Regular charcoal will do fine but will require more checking. The secret to the whole process is to cook extremely slow, as slow as possible and still start the fire. Serve turkey, preferably without the garlic cloves or bay leaves. Now is the time for “Night Train” wine or the good beer. Serve “Night Train” very cold as indicated on the label. The turkey’s also good cold. i had a good day today. With the help of daughter, i touched my toe in the water of the cyber world, learning how to survive there because for goodness sake one cannot live by bread alone: he must be able to navigate the “cloud” and new fangled no-chord technology. We aren’t talking about Philco radios or RCA Victrolas any more. i wrote quite a bit. i did some home projects. i created a post or two i liked. i did some work outside and in my garage. i like to tinker and i tinkered away. Good day. Then i tired from those enjoyments and decided to end the day sorting and throwing away office stuff and cleaning up my documents. There i found the below file i had almost finished but put aside. The idea had far deeper meaning than Jefferson and the fifty-five other British colony representatives who signed the document could have imagined. The idea is no less powerful for their lack of understanding the depth and breadth the meaning of those words would come to hold for everyone, and i mean everyone, who would become, one way or another, citizens of this country, and to the world at large. Madison likely had no idea how impactful his words were to become to the country, but his lack of knowledge of the future does not detract from the power of his concept. As our forefathers before him, Abraham Lincoln did not fully grasp the breadth and depth these words have come to mean to us. Abraham Lincoln was not ready to accept racial equality. Where he lived when he lived was not ready to accept races as equal. That was true of all races. The dominant powerful races ruled, but had the “Native Americans,” the Negroes, and all of the other races had the technical superiority and power of the Caucasians, they too would have considered themselves superior, and quite likely did. Yet Lincoln’s words, especially the last part of the last sentence from that address: “…that this nation, under God, shall have a new birth of freedom — and that government of the people, by the people, for the people, shall not perish from the earth” captured the essence of equality we not only continue to strive for, but believe in all of our hearts, at least those who try to be pure of heart. These forefathers’ worlds were different than ours today. But their ideas captured what we should be still attempting to achieve in the true, complete sense of the words they wrote and spoke even though it was not a complete, perfect thought in their minds. It was their ideas of freedom and equality that has made this country great. It seems to be we have forgotten their ideas of freedom and equality for all humans. In 1970, i had a cup of coffee seventeen times in Qui Nhon, Nha Trang, or Cam Rahn Bay, Vietnam; was caught in the crossfire of .50 cal rifles between mistakened U.S. forces once, friendly fire i think it’s called; thought i was shot at five other times; and at night from my ship’s weather decks, watched tracers from firefights several miles away. About 0200 in Qui Nhon, a cargo ship moored aft of the USNS Geiger (T-AP 197) on the DeLong pier had a zapper charge blow through her cargo hold. i watched from my stateroom porthole as she took on a list, held upright by her mooring lines with the huge tire fenders between her and the pier being blown up in the air and bouncing down the pier while the crew from several Asian countries running down the pier avoiding the bouncing tires and some climbing our accommodation ladder to inquire about joining our Merchant Marine crew. At anchor in Nha Trang Bay after Army intelligence informed us we were a target for zappers in the area, i spent the night with Doc Miles Humphrey, standing by the safety lines on the 03 level, with my .45 cal pistol, the only one of five guns i knew were on the ship, feeling pretty hopeless, watching for any signs of underwater swimmers. The zappers must have been scared away. In 1984-85 with USS Yosemite anchored off of Masirah, Oman, we were informed by Navy intelligence Iranian gunboats might attack us. We had ad hoc .50 cal rifle teams posted around the perimeter of the main deck and 02 levels for a week or so. Checking out these teams with almost no weapons training, the helpless feeling i had in Nha Trang Bay returned. In my 15 years at sea, i experienced about ten near collisions and a half dozen or so storms strong enough to frighten the most experienced mariners. i don’t remember ever being scared in the Navy. I felt helpless those two times, i was concerned, especially when other ships were putting my ship and the crew in danger by not following the rules of the road. i have been frightened a number of times in my non-Navy life. But then, the dangers i brushed near were nothing. Nothing. i have friends, close friends who died. i have friends who were horribly injured and brutally tortured — none of them talk about it, or regret it. Death, pain, long term disability are part of the agreement. They are proud of their service. i’m proud of my service too, but my service was not so much service as a means to financial security and more so going to sea on ships. Still i am proud of my service. Jimmy and Estelle Jewell, autumn, 1943.
i think of my father’s service and the service of his generation. 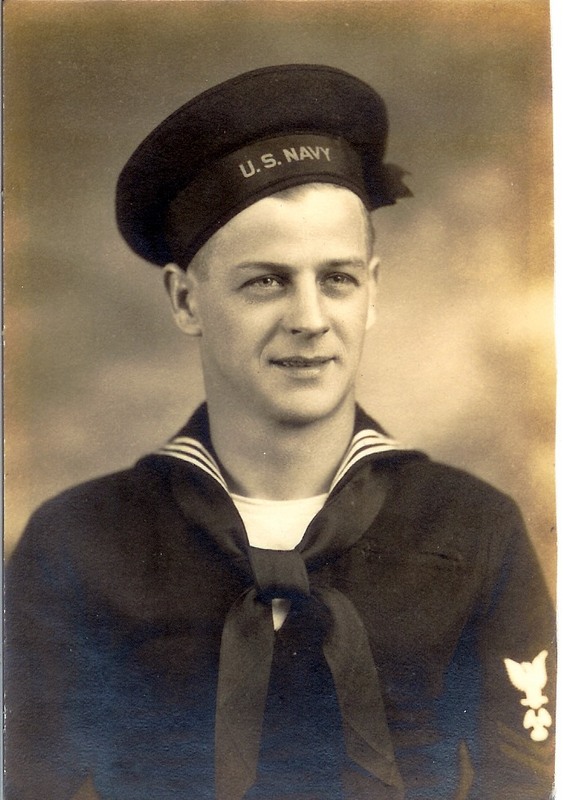 It is mind boggling to me: he and all of the other men in that generation who dropped the only lives they had ever known to fight a war in places they had never dreamed of much less been to. Jimmy Jewell was a youthful automobile mechanic in small country town with his first child on the way. He decided to enlist before being called by the draft. He felt it was his best choice and would allow him to serve using his expertise, fixing things, like automobiles. 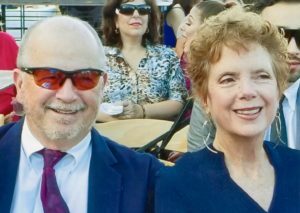 With a pregnant wife and a sense of duty conflicting in his decision making, he made his decision based on the inevitable service he knew would come to pass. He took with him a pocket-size faux leather album he kept in his pocket the entire time he was gone containing precious photos like the one here of his wife and him. 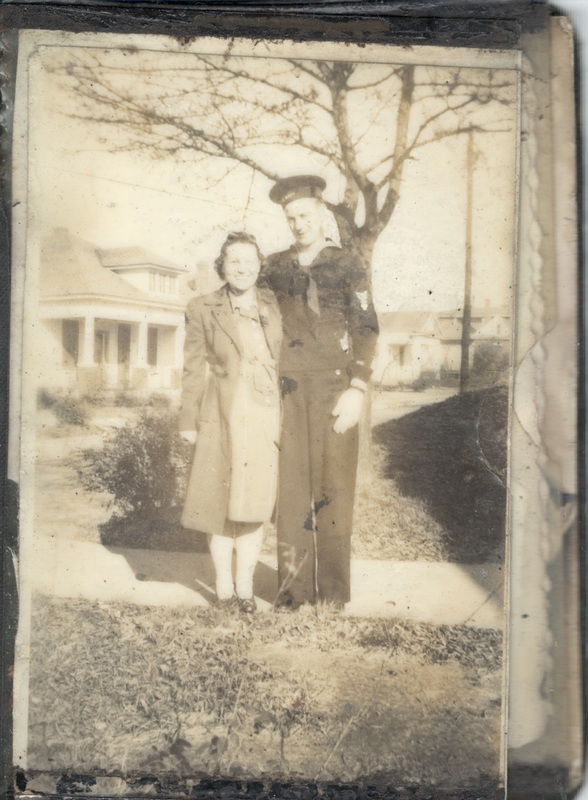 i try to imagine how he felt as he went to Parris Island, South Carolina for boot camp, and Davisville, Rhode Island for Seabee training, and Gulfport, Mississippi to wait for his ship, places in the states he had never been. Then, what was on his mind when, with 1 five-month old son and his wife on his mind, boarding that liberty ship, traversing the Panama Canal, picking up more 75th Battalion Seabees in San Francisco, crossing the Pacific, and spending almost two years, in the middle of a war like no wars in its expanse. I try to imagine him watching kamikaze planes from his motor pool crashing before they reached him. i have been to several of the places in the South Pacific where he had been thirty or forty years earlier. i understand why many of his photos show him shirtless in the intense heat and humidity on those jungle islands. 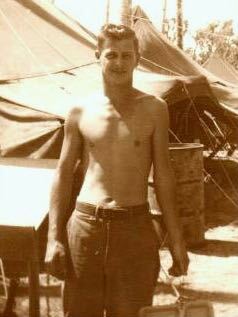 The stories he told me about those times in the war at Espiritu Santo, Vanuatu, New Caledonia; Bougainville, New Guinea; an LST ride to Luzon, Philippines. He showed me photos as he told me the stories and gave me a box with those photos to keep. i fervently wish we had taken time for him to tell me more stories and also wish i had recorded those stories in order to get them right in the retelling. But there was one photo that tells it all for me. Today, Veteran’s Day, is not just to honor those who died in service. The ensign (U.S. flag to you non-Navy folks) is flown two-blocked, not at half mast for it is a day to be proud of our service, not sad. Still there are those who didn’t come back from their service. They remain in places their sons and daughters won’t ever visit. One of those who didn’t come back could have been my father. Heck, now that i think about it, i might not have come back from some of my service: just haven’t thought of it in that way before. 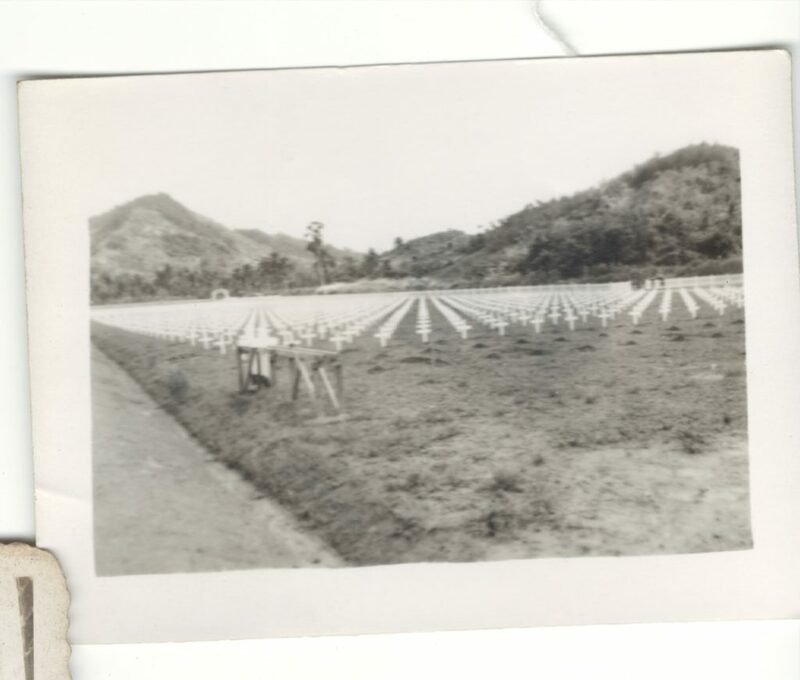 U.S. Military Cemetery, World War II, Luzon. Amy Beth Hale posted on Facebook this morning about getting a new microwave oven. She had put off doing so for about a year and a half after the old one went out, and did so mostly because the light over the stove died with the old microwave. It brought back a memory of a microwave that wasn’t so benign in its passing. It is a second hand story, so i will attempt to keep it anonymous for i cannot vouch for the veracity. But it’s a good story. Out west in a hilly region of the countryside, there is a wonderful golf course: tough, up and down among many pines with narrow fairways and small greens, and a small lake. Homes are built around the beautiful private course and many of the residents are club members. Several of these members played a couple of rounds each week with each other with small wagers. One such wager was at the fourteenth tee at the back of the lake. The group had a standing bet they would all pay a hundred bucks if someone could hit a ball off the tee about sixty degrees right of the fairway line and reach the other side of the lake, about 290 yards away. Each time, they reached the fourteenth tee, they would take turns before their tee shots for the match to try and hit the other side of the lake. One member whose home was behind the fourteenth tee was often close but still short of his goal. He knew the harder the golf ball, the further it would go. So he devised his plan of winning the standing bet. As they walked from the thirteenth green to the next tee box, he said he had to run inside his house and get something out of the kitchen. When he got inside, he placed his golf ball in his kitchen microwave and turned it on high, figuring microwaving it for a minute or so would make the ball hard enough to go longer and get his shot to other side of the lake. He turned on the microwave. The other golfers heard the blast. The microwave exploded and ruined a good portion of the kitchen. The golfer/house owner never found the golf ball. His future tee shots never reached the other side of the lake. i’m not sure why, but i laugh every time i think of that story.